What looks like a pile of rocks to us today is a means of communication to a prehistoric civilization. What exactly they are communicating remains a mystery. 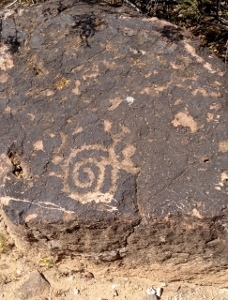 Engraved on the black basalt stones a person can find deer (some of them butting heads), a spiral (could it represent the sun? ), and what appears to be snakes and lizards (or are they maps of a river?). A museum links the past to the present — who the people are that were here before us and how the site was rediscovered during the construction of the Adobe Dam. On display are tools used by prehistoric people and tools used by modern-day archaeologists to dig and uncover the past. 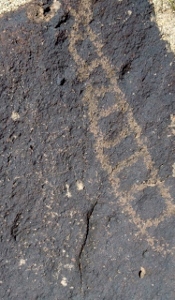 A quarter-mile trail links the museum that blends in with the dam to a large concentration of petroglyphs on Hedgpeth Hills. Walking along the trail it’s not hard to imagine the Hohokam, Archaic, or Patayin traveling through the area seeking water, shelter, and food. Native plants are labeled and easily identified along the path. Keep your eyes open for Gila monsters, rattlesnakes, hawks, and rabbits that live in the habitat. Also seen from the trail are modern-day homes and the spillway for the dam. A small garden with plants used by prehistoric people sits next to a fire pit. Nearby is the Agave Research Project, designed to explore agave rock piles and how and why they were used by prehistoric people around the Southwest to grow agaves. Children can spend the day learning about archaeology by participating in a mock dig. Walking through the meditative cactus garden one can’t help but contemplate the mark of the prehistoric civilization on the land and consider the one that is being left today for a future civilization to discover. On the tour a guide points out a mark made by vandals not too long ago. Next to it are some prehistoric markings. Will future generations find meaning behind our messages today or will they see graffiti left on rocks? Admission is $7 per person. Binoculars are available for rental from the museum for $1. Dress appropriately for the summer heat and bring a water bottle. For hours of operation contact the Deer Valley Petroglyph Preserve, 3711 West Deer Valley Road, Phoenix, AZ 85308, 623-582-8007, shesc.asu.edu/dvpp.